Asphalt shingle cleaner removes ugly roof fungus and roof algae disappears. Asphalt Shingle Roof Mold Cleaner OX makes removing roof algae and roof fungus stains easy! safely cleans stained shingles and restores natural color. All-In-One box – Save a Bundle! 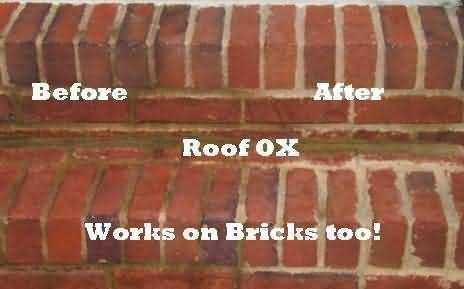 Roof OX oxygen cleaner powered by detergents and surfactants to revive your roof. Simple – No measure Roof Cleaner EZ pouch – guarantee FULL coverage. Safe – Eco Friendly Roof Shingle Cleaner. Shingle Roof Cleaner OX is powered by oxygen. Non-toxic environmentally safe roof cleaner has no harmful by-products and safely decomposes into Water, Oxygen and Soda Ash. Water Activated Shingle Roof Cleaner Ox releases a oxygen shingle cleaning roof fungus stain remover. Shingle Roof Cleaner OX breaks down and removes organic roof stains (especially roof mold, fungus and roof algae) from shingle roofs. How do I apply Asphalt Shingle Roof Cleaner OX? Just use a pressurized sprayer and garden hose. Add water to the concentrated Shingle Roof Cleaner OX Pouch, apply, wait and rinse. 2 gallons (325 sq ft) per EZ pouch. Making 8 gallons of Shingle Roof Cleaner. Enough roof cleaner to treat 1500 sq ft of shingle roof. Traditional asphalt shingle roof cleaning methods use harsh toxic chemicals and acids like chlorine bleach, TSP (trisodium phosphate) or oxalic acid. Care must be taken not to spill these materials as they can harm you, your pets, plants, clothing or other sensitive materials. Roof Shingle Cleaner OX uses the power of oxygen. 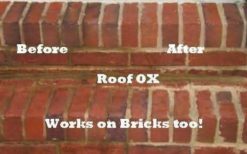 Roof Cleaner OX’s bubbling oxidizer penetrates through shingle discoloration caused by roof fungus, mold and algae for an effective removal of roof stains. Roof Cleaning effects are visible by the discoloration of the roof algae surface, and penetration of the roof fungus hyphae roots. Shingle Roof Cleaner OX is a truly safe, green and eco-friendly alternative to traditional shingle roof cleaning. Roof Cleaning with Roof Cleaner OX gets rid of organic roof fungus stains without harming plants, animals, gutters or siding. Shingle Roof Mold Cleaner OX has no harmful side effects of chlorine bleaches. 100% biodegradable and safe for vegetation, animals, gutters, and siding. Compared with chlorine bleaching chemicals that leave contaminating residues in the environment, Shingle Roof Cleaner OX is an environmentally friendly roof cleaning alternative which decomposes into oxygen, water and natural soda ash. Residual cleaning boost effect is reactivated by rainfall, allowing further removal of roof stains to occur. How does Shingle Roof Cleaner OX remove black roof algae and roof fungus stains? Roof fungus stains are actually colonies of roof algae large enough to be seen from the ground. The roof algae produce chemical compounds that absorb sunlight (typically black or dark green). Shingle Roof Cleaner OX alters the algae stain’s molecular structure preventing roof fungus and roof algae from absorbs the sunlight. Essentially reducing the ability of the roof stain to reflect visible light, this has the effect of reducing the appearance of the roof stain, at times making roof mold fungus colorless and appearing to vanish. Shingle Roof Cleaner OX oxidizes the shingle staining elements of roof algae, roof mold and shingle fungus, making them colorless. With the help of hydrogen peroxide, which changes the acidity level of organic matter, the Shingle Roof Cleaner OX attaches to the roof fungus stain and changes the chemical makeup of the roof stain. Soda ash decomposed from sodium percarbonate increases the pH value to knock down calcium ion and magnesium ion, thus softening the water and deepening the roof stain removal and shingle cleaning effect. Soda Ash also reduces the negative charges of dirt and shingle granules resulting in repelling dirt from the roof granules, which leads to the improved roof mold and fungus stain removal effects. Sodium percarbonate (often called Oxygen Bleach) a solid form of hydrogen peroxide bonded with natural soda ash. Roof Cleaner OX is activated by water where it releases oxygen which provides shingle cleaning and roof stain removal. Upon contact with water, sodium carbonate peroxhydrate breaks down into sodium carbonate and hydrogen peroxide. The dual properties of sodium carbonate and hydrogen peroxide provide significant benefits in environmental applications as a solid easy to use source of alkaline hydrogen peroxide, enabling a powerful roof stain removal system to be packed into a concentrated powder. Shingle Roof Cleaner OX is ideal for homeowners. Powerful roof mold and mildew removal, yet easy to handle, safe on all surfaces, our most environmentally friendly shingle roof cleaner. Roof Cleaner QSE is an industrial strength roof cleaner formula for professionals or extreme the Do-It-Yourself (DIY) homeowner who need quick results from a heavy duty roof cleaner. The number (1500, 3000 or 4500) on Roof Cleaner OX products represents FULL STRENGTH COVERAGE, 100% strength, no ranges, no guessing. What is the Shingle Roof Cleaner EZ-pouch? Shingle Roof Cleaner EZ pouch packaging makes using a Shingle Roof Cleaner easier. Each EZ pouch is a pre-measured water activated powder. Once my Roof is clean, how do I prevent roof fungus and roof algae stains? 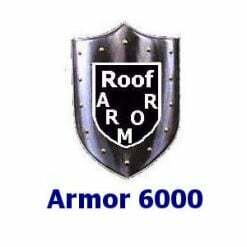 Roof ARMOR Protectant prevents roof fungus, roof algae and roof mold from returning. No rinsing required with Roof Armor. What are the Green and Black fungus on my roof? The streaks, Roof fungus, Roof Stains, Roof Mold, Algae Stains; call it what you want! You have been invaded by Gloeocapsa magma, a very hardy algae. the continental U.S.A., it prefers humid environments. Roof algae was probably deposited on your roof by wind and/or wildlife. The streaks and discoloration is an accumulation of the algae’s dead, dark-colored cells. Use a Premium Shingle Roof Cleaner for roof mold removal (removes black streaks and roof stains) Follow roof mold removal with Roof Armor a Roof Protectant that prevents regrowth of the roof stains, and black roof streaks. together for only $68.50 & free shipping! What do our customers say about Roof Mold Cleaner OX-1500? I love the product because it works. The fact that is non-corrosive, safe for me, and safe for the environment is great. It also prevents me from having to handle bleach, and prevents me from having to add 50 or more plastic bleach bottles per month to a landfill. At a time when there is tremendous need to become more earth friendly, OX has helped my small company greatly reduce its impact on the environment. I had tried big box cleaners, and a couple other attempts to revive my stained roof. But then I found Roof OX! The price was over $30 less than a competitor for the same coverage, so I admit I was skeptical, but I needed my roof clean!Once ordered, the Roof OX arrived in 3 days, and had complete directions. I applied it, rinsed, and to my surprise, the stains rolled off my roof!! I would not have believed it, but I watched it!